Who needs a tour guide when you have Google Maps? Today, Google loaded up an additional 20 indoor maps for folks to use when they’re visiting some of America’s more well known cultural offerings. Museums such as the de Young in San Francisco, the Philadelphia Museum of Art and the Cincinnati Museum Center are all now supported. 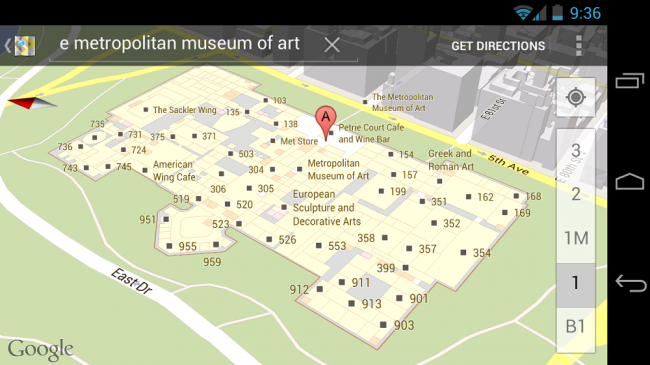 To check out some of these neat new perspectives, simply locate one of the buildings on your Maps, then scroll in to navigate through the various exhibits. If you are located at one of these places, you can even access the navigation feature so you don’t get lost in the halls. For a full listing of available indoor maps, see here.